...over all of these necklace at Mutenkowhai. The designs are unexpected, creative, and would definitely spruce up a boring outfit (does anyone else feel like they have nothing to wear or is it just me?) These are my favorite pieces. I have one of her necklaces. It's simple but so pretty. I'd love that first one as well! ooh, love the first one! that first one is GORGEOUS! i couldn't even concentrate on the others. i was hypnotized by that pretty shade of blue. I agree with you, these are drool worthy! you had me at the admiral returns. that's my favorite! :) really, how unusual and the combination of textures i truly love! ooo, so pretty and delicate! I LOOOOOOOOOOVE that blue one! Thanks for showing these! Gorgeous- love the first one. These are incredible! I love the third one, it's sort of regal and that little gold chain strung on is the loveliest accent. And yes, I have nothing to wear either. The first necklace is gorgeous, and would even look great in yellow. 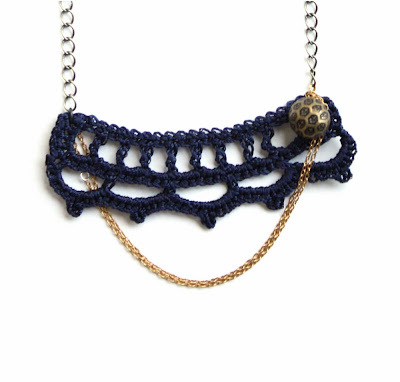 Lace taco is an unexpected but completely surprisingly beautiful combo. I always like fabric and metal together.